The black-winged cuckooshrike (Lalage melaschistos) belongs to the family of trillers, minivets and cuckooshrikes, Campephagidae. The black-winged cuckooshrike species is distributed in India, Pakistan, Nepal, Bhutan, Bangladesh, southeast Asia, China and Japan. This cuckooshrike species is unrelated to shrikes or cuckoos. These cuckooshrikes are polytypic species. The black-winged cuckooshrike (Lalage melaschistos) is a medium-sized cuckooshrike, measuring 20 to 25 cm in length and weighing 35 to 40 grams. It has gray and white plumage. The adult black-winged cuckooshrike has slaty gray upperparts and underparts. The wings and the tail are blackish. The vent region is white. The female is slightly lighter in color with light barring on the underparts. The undertail appears graduated and has white feather tips. The black-winged cuckooshrike bill is blackish gray and slightly curved. The irises are blackish. There are two small white crescent shaped patches located above and below the eye-ring. The legs are blackish gray. The black-winged cuckooshrike call is a high-pitched, descending, slurred whistles and loud "twit..twit" sound. The black-winged cuckooshrike species are distributed in India, Bhutan, Bangladesh, Nepal, Pakistan, China, Taiwan, Japan, Myanmar, Thailand, Cambodia, Laos and Vietnam. In India, these black-winged cuckooshrikes are distributed in the states of Jammu and Kashmir, Haryana, Punjab, Himachal Pradesh, Uttarakhand, Uttar Pradesh, Bihar, West Bengal, Odisha, Jharkhand, Chhattisgarh, Madhya Pradesh, Rajasthan, Gujarat, Maharashtra, Assam, Meghalaya, Arunachal Pradesh, Nagaland, Manipur, Tripura and Mizoram. The black-winged cuckooshrike nominate subspecies L. m. melaschistos is distributed in northern Pakistan, Himalayan states of north and northwest India, north of northeast India, southern China and northwest Myanmar. Non breeding populations occur in northeast India, Bangladesh and northwest Thailand. The black-winged cuckooshrike subspecies L. m. intermedia is distributed in central, east and southeast China. Non-breeding populations occur in southern Myanmar, southern Thailand, southern Vietnam, southern China and Taiwan. The black-winged cuckooshrike subspecies L. m. avensis is distributed in southwest China, south Myanmar, north Thailand, northern Laos and north and central Vietnam. Non-breeding populations of these subspecies are found in southern Myanmar, southern Thailand and southern Vietnam and Cambodia. The black-winged cuckooshrike subspecies L. m. saturata is distributed in northeast and central Vietnam and south China (Hainan). Non-breeding populations of L. m. saturata occur in west Thailand, southern Laos, Cambodia and central Vietnam. The Important Bird and Biodiversity Areas (IBA) of the black-winged cuckooshrike in Cambodia are Snoul, Keo Sema and O Reang. Some of the IBA in Nepal are Bardia National Park, Chitwan National Park, Khaptad National Park, Langtang National Park and Mai Valley forests. These black-winged cuckooshrike species have moderate forest dependence. They normally occur in altitudes from 0 to 2500 meters. The artificial ecosystems and habitats of these species include rural gardens, cultivated lands and plantations. 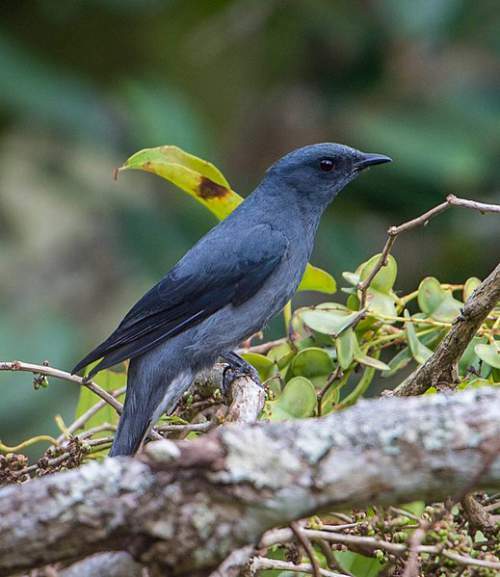 The natural ecosystems and habitats of these cuckooshrike species include tropical and subtropical moist montane forests, moist shrublands, broad-leaved forests, secondary forests and tropical and subtropical moist lowland forests. The diet of black-winged cuckooshrike consists mainly of insects. Insects, caterpillars, beetles, grasshoppers, cicadas, moths, butterflies and crickets are their primary food. They occasionally feed on fruits. These black-winged cuckooshrike species hunt insect prey in the forests. They form feeding flocks with other small birds. The cuckooshrikes hawk airborne insects and also glean their prey from the foliage and branches of trees. The breeding season of the black-winged cuckooshrike species is from April to July in most of their breeding range. These birds are monogamous and highly territorial. The nest of the the black-winged cuckooshrike is a small cup-like structure, made of twigs, rootlets and plant fibers, which are bound by cobwebs. The nest is constructed 3-8 meters above the ground. Both parents take part in building the nest on tree branches. The cuckooshrike clutch is two or three eggs. The breeding pair take turns to incubate the eggs. The parents brood the chicks and keep feeding them till they fledge. These black-winged cuckooshrike species are partially migratory birds. The breeding populations in higher altitudes move to lower levels and plains during winter. The breeding populations in China and northern Vietnam are migratory and migrate southwards to Taiwan, central and east India, Bangladesh, southern Myanmar, southern Thailand, southern Vietnam and Cambodia for wintering. Post breeding, the juveniles of the resident black-winged cuckooshrikes may disperse and establish in new locations within the range. They may make local movements for feeding and breeding within their range. The global population size of the black-winged cuckooshrike (Lalage melaschistos) has not been quantified. The overall population trend of the species is considered to be stable. Throughout its range, the cuckooshrike species is reported to be very rare to locally common. The generation length is 4.6 years. Its distribution size is about 8,370,000 sq.km. Habitat alteration and destruction, deforestation and trapping for pet-trade are the main threats that may endanger the survival of this cuckooshrike species. 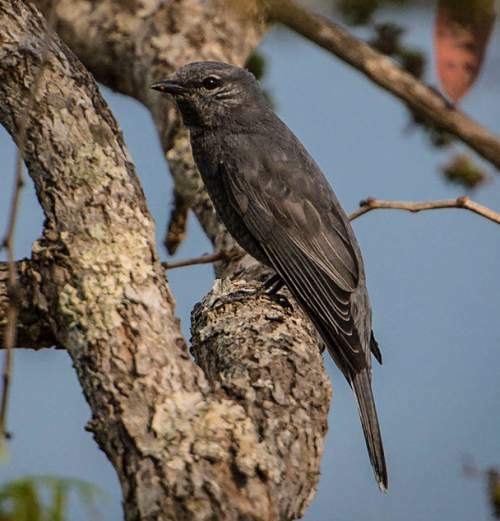 The black-winged cuckooshrike (Lalage melaschistos) does not approach the thresholds for being Vulnerable either under the range size criterion, or under the population trend criterion or under the population size criterion. 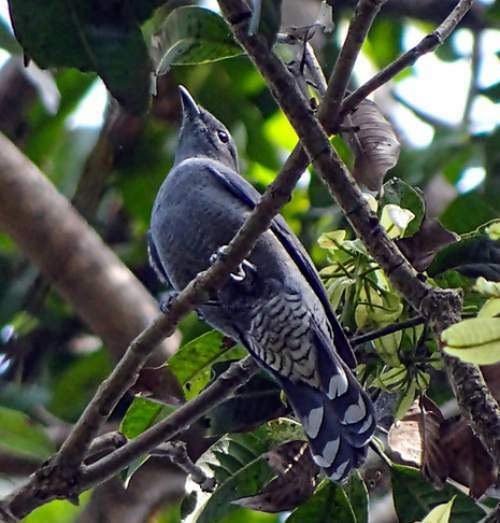 The IUCN (International Union for Conservation of Nature) has categorized and evaluated the cuckooshrike species and has listed it as of "Least Concern". The CITES (Convention on International Trade in Endangered Species of Wild Fauna and Flora) status is ‘Not Evaluated’ for black-winged cuckooshrike (Lalage melaschistos). The black-winged cuckooshrike (Lalage melaschistos) is closely related to lesser cuckooshrike (Lalage fimbriata) and black-headed cuckooshrike (Lalage melanoptera). The four recognized subspecies of the black-winged cuckooshrike (Lalage melaschistos) are: Lalage melaschistos melaschistos (Hodgson, 1836), Lalage melaschistos intermedia (A. O. Hume, 1877), Lalage melaschistos avensis (Blyth, 1852) and Lalage melaschistos saturata (Swinhoe, 1870). Current topic in Birds of India: Black-winged Cuckooshrike - Lalage melaschistos.